Last Updated: April 5, 2019 | Subscribe to our weekly newsletter! Have you ever dove into a pitch black pool? It’s a little scary, isn’t it? You can’t tell how close the bottom is, if there’s anything that might be in the way, or whether there’s a swamp creature waiting for you in the murky depths. Aside from keeping you and other swimmers safe during night swims, pool lights and landscape lights can add ambiance, creating a relaxing or even romantic atmosphere. And multicolored lights make the pool fun, and can be part of your pool party decorations. You’ll find no shortage of lights for all types of pools, and the area around the pool. Whether you have an inground, above ground, or Intex pool, you can find several options to add light and color to your swims. Don’t forget to add some lights around the pool deck and in the landscaping, too. Your inground pool probably already has lights installed. But have you thought about upgrading them? If you don’t already have LED pool lights, give them a try. They add brightness and longevity while using less energy to save you money. Older style incandescent pool lights give off warm light that’s further dimmed by the water. This bright white light If you click this link and make a purchase, we earn a commission at no additional cost to you. creates a clearer swimming environment, making night swims safer for you and your family. 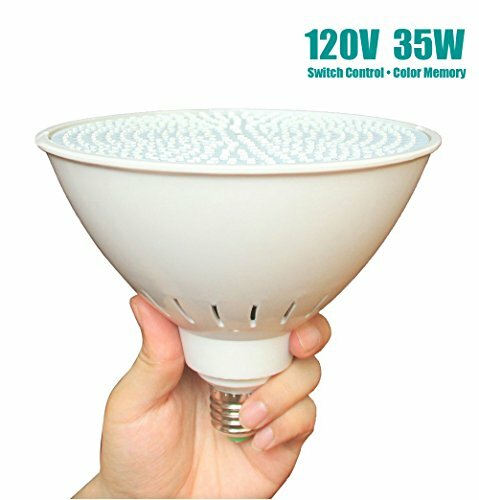 This 60W LED light is specifically designed to replace 500W R40 incandescent bulbs. Replacement is easy. Simply unscrew your incandescent bulb and install the LED lamp, then watch the energy and electricity bill savings roll in. Want something more than just plain white? Try a multicolored one! 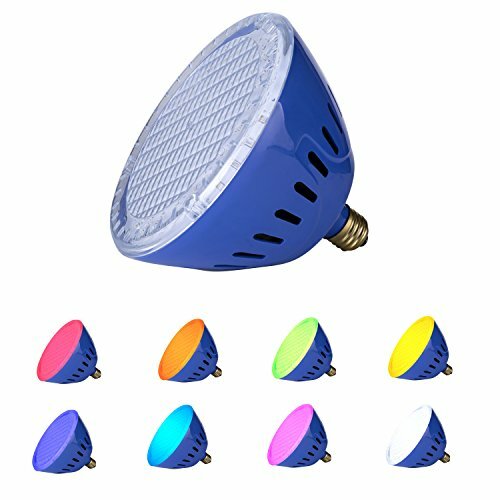 This 35W screw socket LED light offers five colors If you click this link and make a purchase, we earn a commission at no additional cost to you. , and multiple show speeds for a variety of effects. It’s also the perfect option to replace halogen or incandescent bulbs for brighter lights, less energy use, and lower electric bills. One small inconvenience may be that it has no remote, and must be operated by the main power switch. But that may be a small price to pay for better and brighter pool lights. This 50W LED light has enough power to light a 30,000-gallon pool. It’s rated for 60,000+ hours of operation, and includes built-in overheating protection If you click this link and make a purchase, we earn a commission at no additional cost to you. technology to increase longevity. Its special optical lens design creates a converging beam for more even lighting. It also comes with a 100% satisfaction guarantee, premium support, and an 18-month warranty. You can’t go wrong with this one! Like the bright white TOVEENEN, this multicolored LED light is specifically designed to replace incandescent pool lights. 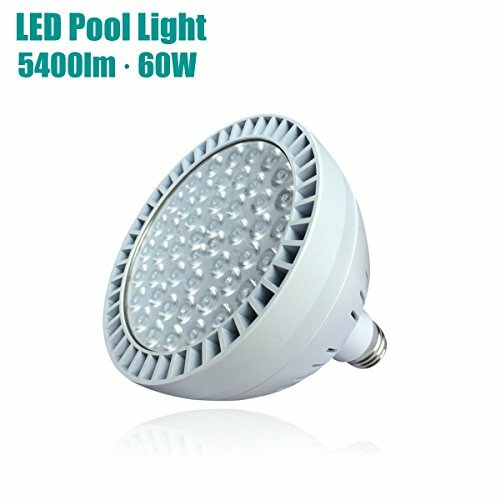 The LED will provide more light and last longer than any incandescent option, and just one bulb can light up 16 × 32 foot pool. The light simply screws into an existing lamp base, and offers seven brilliant fixed colors, and nine dazzling light shows. It also has a memory feature If you click this link and make a purchase, we earn a commission at no additional cost to you. e, which saves the last color mode in use when the lamp is turned off, saving you from having to program your favorite options over and over again. With even light distribution and a wide beam spread, this LED light eliminates the end shadow effect common with other pool lights. In addition to the six colors it produces—including white—it has two color-changing modes, and four colored trim rings, allowing you to match your pool’s surface If you click this link and make a purchase, we earn a commission at no additional cost to you. . 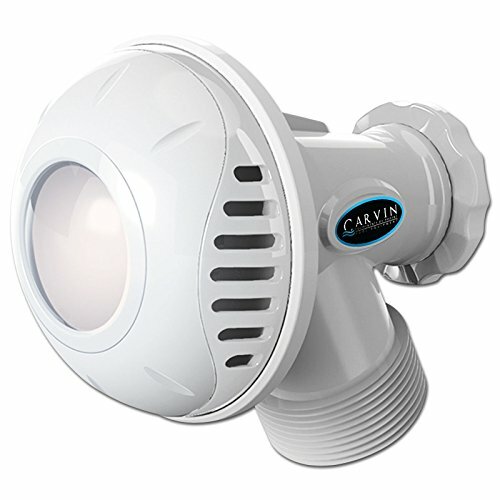 This light is ideal for gunite, fiberglass, and vinyl liner pools, and can be used for new construction, retrofits, or conversions to LED. The light offers 50,000 hours of lamp life, and comes with a three-year warranty. You may not be able to install any pool lights directly into your above ground pool walls the way you can with an inground pool, but that doesn’t mean you have to swim in the dark. So what happens when you have an above ground pool, and you can’t plug any pool lights into the walls? You use a light and water return combo If you click this link and make a purchase, we earn a commission at no additional cost to you. ! This light fits the existing water return hole pre-punched by most aboveground pool manufacturers. 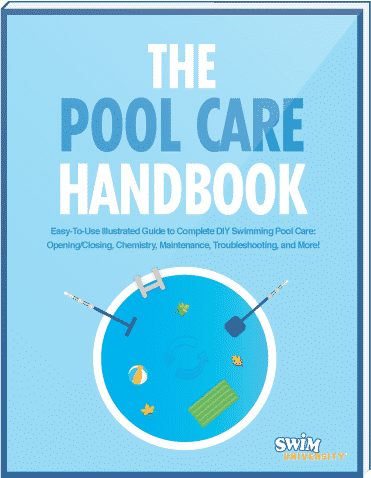 So there’s no need to cut new holes and risk voiding your pool manufacturer’s warranty. This light has a 25-inch plug-in cord. It also comes with a hard plumbing adapter, and a fountain attachment is also available If you click this link and make a purchase, we earn a commission at no additional cost to you. .
Another efficient combo, this light transforms standard return fittings into underwater pool lights. The waterproof body provides super-bright, white LED light. Its directional water flow collar also replaces existing return fittings for better circulation If you click this link and make a purchase, we earn a commission at no additional cost to you. . 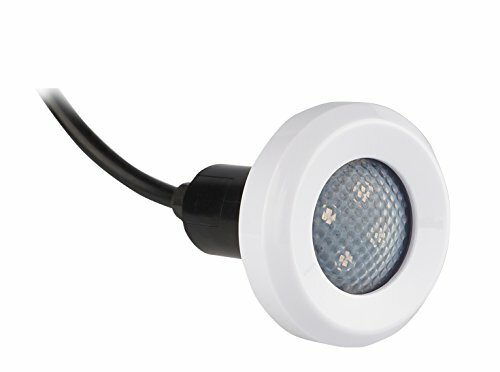 The low-output 12v LED bulb offers long-lasting, energy-efficient pool lighting, and comes complete with 15-foot cord with standard 3-prong plug. 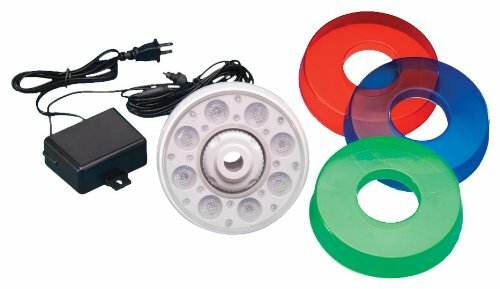 Not only can you replace your existing water returns with pool lights, you can get one with three colored lenses, including white. 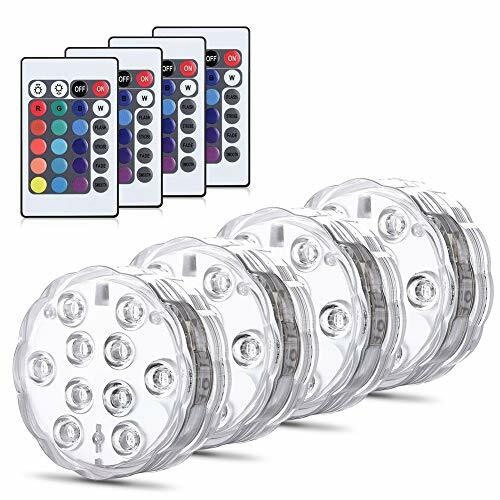 This combo’s eight super-bright LED lights will last for more than 100,000 hours If you click this link and make a purchase, we earn a commission at no additional cost to you. , giving you thousands of safe and fun night swims. The sealed 12v transformer and power switch are weathertight for peace of mind, and the quick disconnect makes winterizing easy. The light comes with a 25-foot cord and is UL/CA listed for safety. 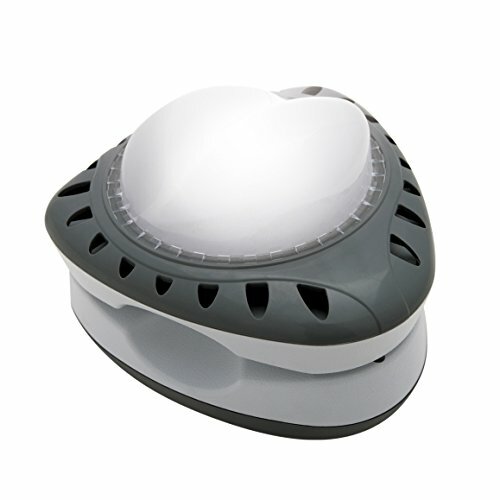 This 50W white light is tested to UL Standard 676, so you can be assured of swimmers’ safety. 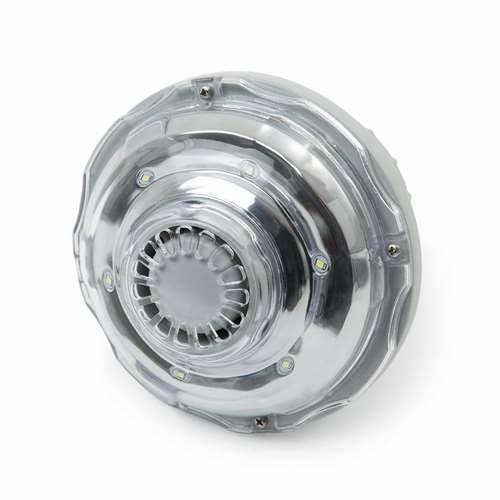 Its patented reflector design maximizes illumination, and it requires to drilling or draining to install. It also comes with a 12v transformer, a 28-foot power cord, a chemical resistant lens to prevent clouding If you click this link and make a purchase, we earn a commission at no additional cost to you. , and fuse overload protection. One light is enough to illuminate most above ground pools. Don’t want the hassle of replacing your water return just to add pool lights? Consider these freestanding lights If you click this link and make a purchase, we earn a commission at no additional cost to you. instead. Each light disc is powered by three AAA batteries (not included), and offers 16 static color modes and 3 color-changing modes. The discs also have an O-ring seal design to keep water out, as well as four remotes to control all four discs, though all discs can also be controlled with just one remote. 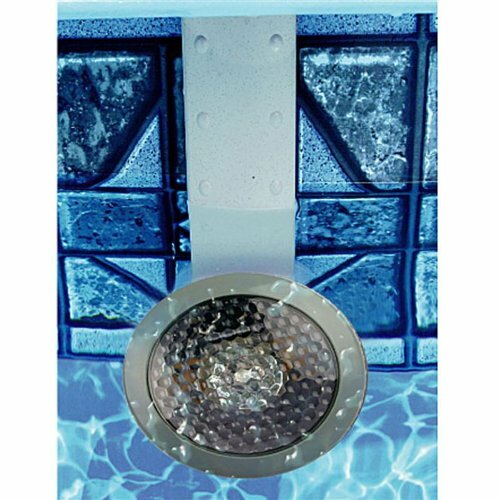 Did you know you could find pool lights specifically made for Intex pools? You can! Wait. 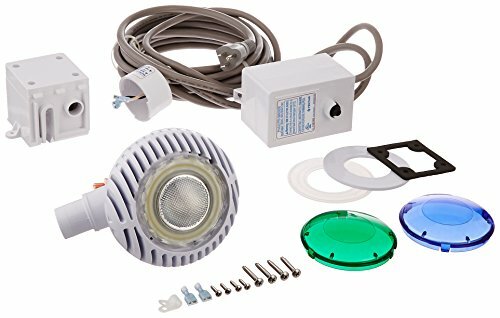 This is a magnetic light that only works in pool that do not have metal walls? What the heck?! That’s because this light uses magnetic technology If you click this link and make a purchase, we earn a commission at no additional cost to you. to generate a low voltage current through your pool’s sidewall, which means you don’t have to worry about batteries. The magnet generates enough power to deliver more brightness than a 50W halogen light. The light comes features a standard 120v plug, and comes with a 12v transformer and 23-foot power cord. It’s also available in a two-pack If you click this link and make a purchase, we earn a commission at no additional cost to you. .
Never mind the magnets. This Intex light features a built-in hydroelectric generator If you click this link and make a purchase, we earn a commission at no additional cost to you. , so no batteries or external power sources are needed. The 1.5W white LED light fits Intex pools with a 1.5-inch hose filter pump (1,200gph to 3,200gph). The light is easily mounted on the pool’s inlet fitting, and includes a built-in check valve to prevent misassembly. Why worry about batteries, transformers, and power cords when you can light up your pool with the power of the sun? 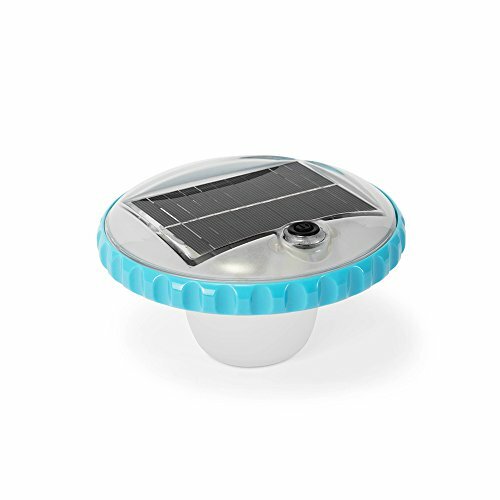 This solar-powered LED light features an automatic on/off mode If you click this link and make a purchase, we earn a commission at no additional cost to you. that turns on at night and turns off at sunrise. 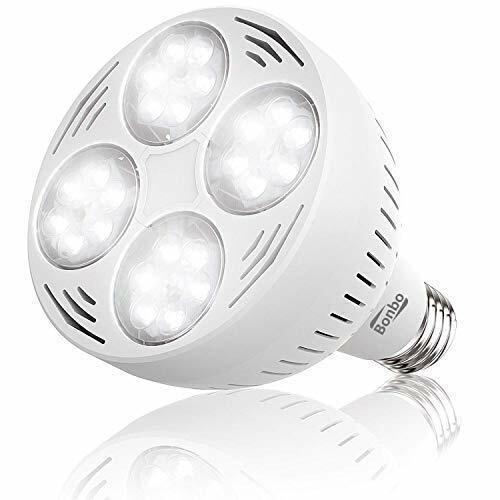 It also has two light modes for white light and smooth color changing, as well as an automatic shut-off mode which kicks in after two hours in static mode, and five hours in color-change mode, which saves even more energy. Now that your pool’s all lit up, create even more outdoor ambiance with landscape lights. 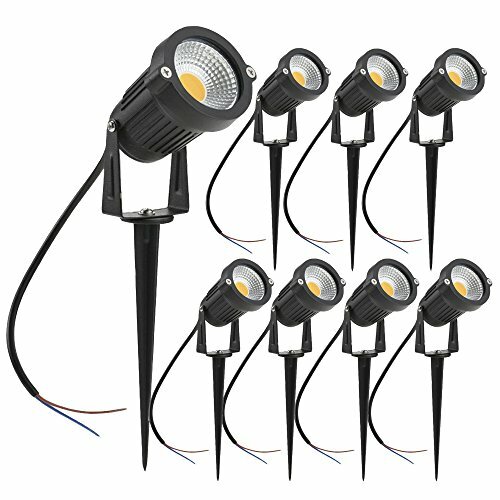 This set of eight lights does double duty, adding beautiful warm light to your garden and pool area while also enhancing your yard’s security. Each light is a 5W LED light that gives off 500 Lumens, and only uses between 12v and 24v. Their thick aluminum bodies and glass lens covers are water resistant If you click this link and make a purchase, we earn a commission at no additional cost to you. , which means they can stand up to wet weather and pool splashout. The lights are rotatable with a 90-degree beam angle and 270-degree adjustable heads. The lights will require a transformer, wire connectors, and low-voltage wires, which are not included. What’s even better than plain ol’ waterproof landscape lights? Solar-powered ones! Not only that, but lights that look like little UFOs! More than just regular landscape lights, these can be mounted along your home’s gutters, on the deck, or even clipped onto your pool fence. They’re available in two options: warm white light or cool white light If you click this link and make a purchase, we earn a commission at no additional cost to you. , so you can choose what works best for your pool area and back yard. The lights automatically come on at night, and turn off at sunrise, so you don’t have to worry about them. They’re constructed from eco-friendly ABS material, are weather resistant, and come with a 12-month warranty. Want to give your backyard pool area a realistic island feel? 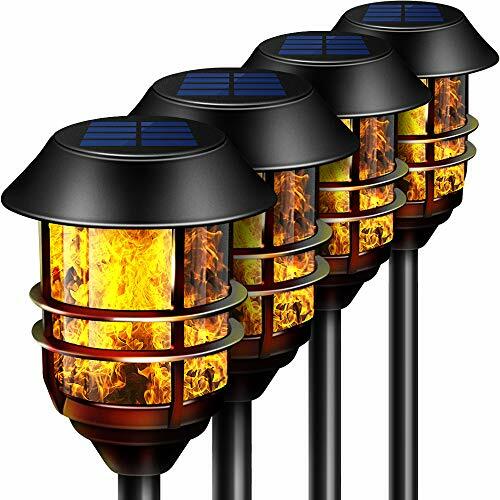 Try this four-pack of metal, solar-powered flame torch lights. They’re stainless steel coated in a rust-resistant black finish, and can be used to light pathways, add ambiance to your patio, or illuminate your pool deck. The torches are adjustable to 23, 39, or 55 inches If you click this link and make a purchase, we earn a commission at no additional cost to you. , giving you even more control over illumination and style. The LED lights dance to give the appearance of real fire torches. 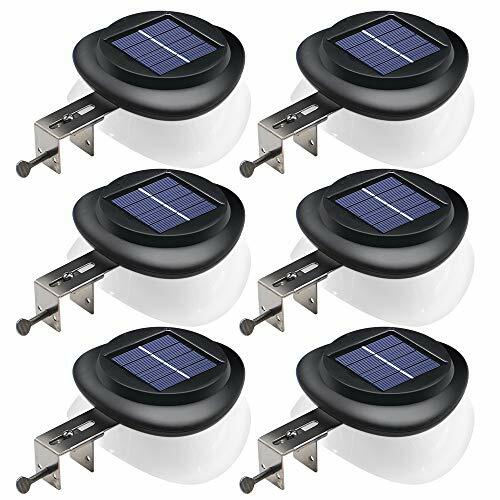 Once their solar cells are charged, the lights can last up to eight hours. They come with a 30-day warranty. No matter what kind of pool you have, or how big (or small) your back yard is, you can add safety, beauty, ambiance, and fun with a handful of carefully placed pool lights and landscape lights. It’s not difficult, and doesn’t have to be hard on your budget, either. It’s just a matter of choosing what works best for you, and what you find most appealing. Have fun with it! Stop struggling with that solar cover, and don't cut it up. Get the right solar cover reel, and make deploying and removing that cover easier on yourself.